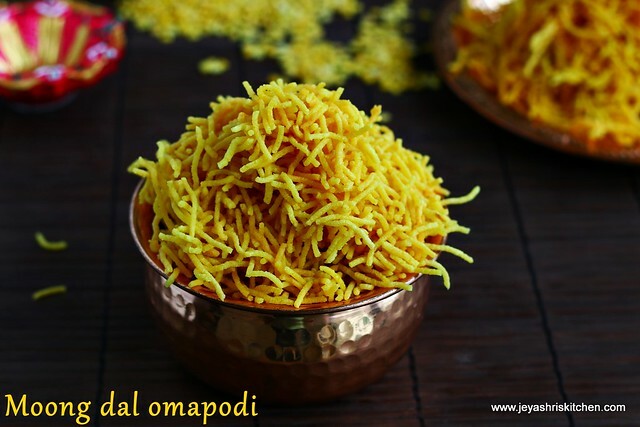 Omapodi | Sev is a snack which is generally added to South Indian mixture. Basically it is made with besan| kadalaimaavu. I still remember during our childhood, we eat these omapodis crazily and finally end up with stomach upset as the besan too much consumed will give that effect. 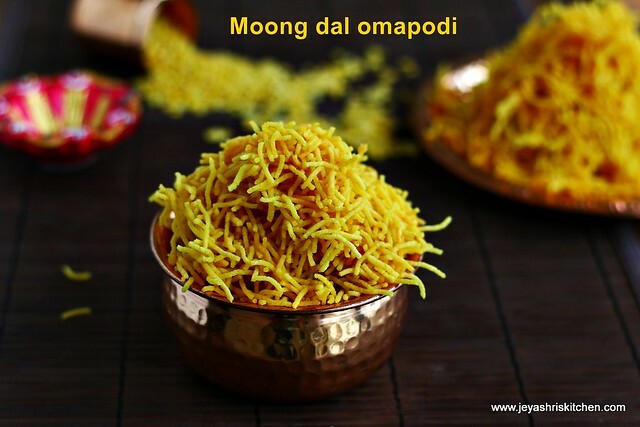 I have already posted the omapodi recipe in jeyashri's kitchen When i come across the moong dal omapodi recipe here, it sounded very nice. When i tried it yesterday, it turned out awesome and was a super hit at home too. 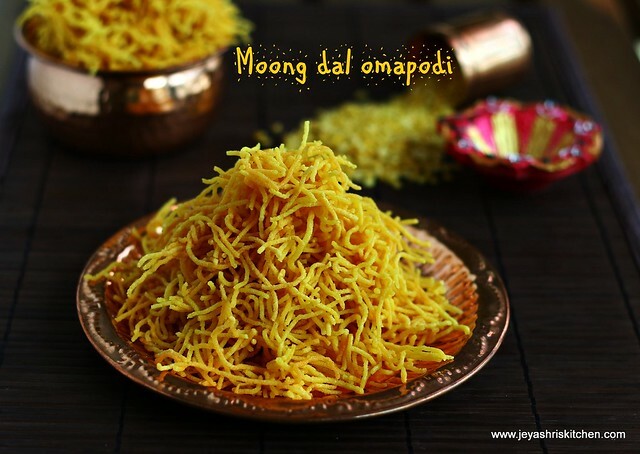 If not for Diwali, this ompaodi is a perfect tea time snack too. The aroma of ajwain| omam and the moong dal flour enhances the taste of the omapodi. Check out my full collections of diwali recipes. Dry roast the omam for 2 minutes, without getting it burnt. Soak it in water for 15 minutes. Dry roast the moong dal for 3-4 minutes. Let it emits a nice aroma. Be careful not to get it burnt. When it is cool, powder this in a mixie into fine powder. Since we have roasted it it will get powdered easily. If you live in India where you have access to rice mills, you can grind the rice and moong dal in the mill into a fine powder. The ratio of rice : moongdal is 2:1. In the mixie add the soaked ajwain|omam and grind it nicely. Generally omam will not get grind easily. Add little water and nicely mash with your hands and extract the juice. In a wide bowl add the rice flour, moong dal flour, butter, asafoetida and salt. Add this omam water to this . Add hot oil and water to this and knead this into a soft dough. I added a pinch of turmeric powder to get nice yellow colour, as my besan was bit dull in colour. Put the dough inside the achu, keep the rest of the dough covered all the times. If making in bulk do not mix the flour with water and make the dough in advance. It will lead to dark reddish colour omapodis. Squeeze the omapodis into hot oil. Fry till the shh sound of the oil subsides. Drain them in a kitchen towel, Repeat the same for the rest of the dough. Store this in a airtight container. You can roast and powder the ajwain|omam and add . 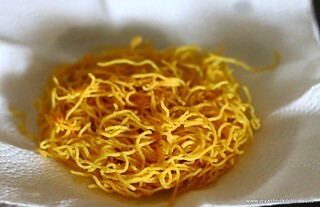 Adding hot oil gives crispiness to the omapodi. So don't skip it.